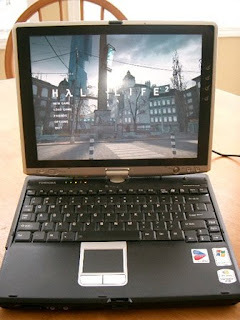 Back 2004, I got a new Toshiba Portege M200 Tablet PC for work. It was the cream of the crop in it's day. I love this thing. It's been the most solid and reliable laptop I've ever seen anybody own; I've been proud to call it mine. It's gone everywhere with me. From west coast, to east coast. I took it to Russia with me, and it was my main development box while I was in France a few months ago. Every time I visit with my friends at coffee shops to code, it goes with me as well. Jennifer uses it exclusively in the house, and the girls even tinker on it from time to time to play WebKinz or draw in MS Paint. I can honestly say that it's been a solid member of the Hardbarger family. Well, Jennifer was upstairs surfing on it this evening, and she got the blue screen of death. I tried a few things to see if I could find what might have happened, but to no avail. It's officially dead.